Home / News / Opinion / Tiglao hits Manila Times editorial: Mocha must go? The Yellows wish! Tiglao hits Manila Times editorial: Mocha must go? The Yellows wish! In one of his columns, veteran journalist Rigoberto Tiglao answers an editorial also from Manila Times published two days ago. “Mocha must go” was the title of editorial, which was obviously about Assistant Secretary Esther Margaux “Mocha” Uson, who’s been a subject of criticisms recently due to the “pepederalismo” video. “I had to check again that the editorial was really in this newspaper and not in the Yellow Philippine Daily Inquirer as that has been the Yellows’ fervent wish ever since President Duterte assumed power.” Tiglao said, who was a former envoy. The columnist added that Uson has always been the opposition’s nightmare ever since she supported President Rodrigo Duterte. “The sanctimonious outrage against that “ pepedederalismo” and the demand for her to be fired is of the same genre as the Yellows’ paroxysms over Duterte’s “Stupid God” description of the biblical deity. Have some sense of humor, guys.” Tiglao wrote. “Nobody was paying attention to federalism except its critics who didn’t bother to read the proposal. Maybe thanks to Mocha they will,” Locsin said in one of his tweets. Mocha’s Facebook Page (Mocha Uson blog) as of today has 5.7 million followers. Yes, nearly 6 million, making it one of the biggest Facebook accounts in this country. That means that when she posts something, for example, like “Never vote an Aquino into the Senate again,” 6 million Filipinos are likely to read it – and probably remember it on election day next year. 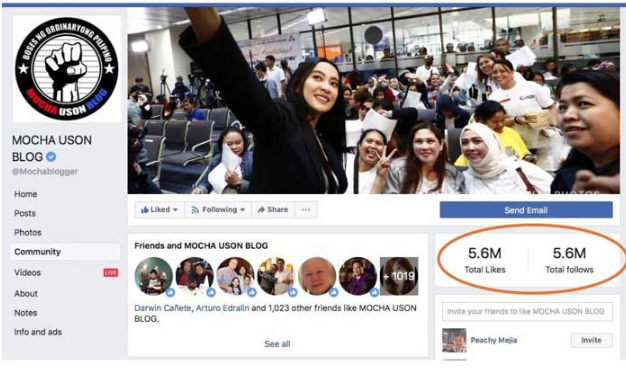 Tiglao stressed out that with Mocha’s page figures, she can already communicate with more Filipinos than all of the newspapers and TV news combined. “Yet the Manila Times editorial claims “Uson is no longer an asset to the Duterte administration, despite her much touted millions of followers”? Whoever wrote that obviously is living in the 1960s, before the age of the Internet and social media.” The former envoy said. The columnist cited a very good example to make people see how powerful Mocha’s reach is. “For instance, the other day she posted a video of her interview with lawyer Glenn Chong explaining how Smartmatic got to transmit election returns a day before election today. It had 870,000 views and 24,000 shares. That is more than the 100,000 combined circulation of the country’s three big broadsheets that have ignored the allegations.” He said. Recently, blogs, photos and articles have been circulating online stating that Clavite was allegedly close to the opposition leaders like Bam Aquino. Tiglao said that Mocha’s article even in Philippine star has farther reach and has even overtaken by miles her colleagues in the Star, who have been writing columns for decades. “With all these varied complex factors, Mocha is a unique phenomenon — who can’t easily be replicated — old-timers in media have been unable to understand. She has become Duterte’s most powerful weapon in these days’ intense propaganda war” he wrote. Ending the article, Tiglao said that the president should instead appoint Mocha as Presidential Social Media adviser.